Posted on 18, July 2016 by EuropaWire PR Editors | This entry was posted in Education, Germany, Healthcare, Science and tagged adult stem cell cultures, Albert-Ludwigs-Universität Freiburg, Alina Platen, BIOSS Centre for Biological Signalling Studies Cluster of Excellence, Department of Microsystems Engineering, Dr.Matthias Meier, IMTEK, Indranil Mitra, Matthias Blazek, Matthias Meier, Microfluidic chip, Nils Schneider, Prof. Dr. Roland Schüle, Prof. Dr. Roland Zengerle, the University of Freibur, Xuanye Wu. Bookmark the permalink. In order to overcome this problem, the Freiburg-based research group has developed a microfluidic chip that works with minute volumes of liquid: The platform uses microchannels to feed cell cultures with nutrients during their three-week growth period. A special feature of the set-up is an automatic protein analysis program integrated into the chip, which decodes signalling pathways during cell growth. 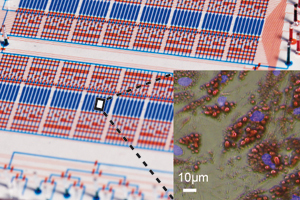 The new technology allows the researchers to vary the external cell factors such that the micro-environment on the chip resembles conditions within the body as closely as possible. This enabled adipose-derived adult stem cells to be successfully converted into mature fat cells within the experiments, and the corresponding signalling pathway mTORC1 was also decoded. “By increasing the calorie content in the nutrient medium, we were able to show that fat is stored more rapidly during maturation,” states Meier. “However, it remains unclear whether adjusting the calorie levels in this way leads to an increased rate of adipose cell formation.” To answer this question, the research team now wants to systematically use the chip technology to study the association between human eating habits and the formation of fat cells. Eight researchers were involved in the study: Matthias Blazek, Matthias Meier, Indranil Mitra, Alina Platen, Nils Schneider, Xuanye Wu and Prof. Dr. Roland Zengerle conduct research at the Department of Microsystems Engineering (IMTEK) and belong to the BIOSS Centre for Biological Signalling Studies Cluster of Excellence at the University of Freiburg. Prof. Dr. Roland Schüle is the Scientific Director of the Centre for Clinical Research at Freiburg University Hospital.